Sally Yates spent decades defying enraged politicians before Donald Trump. One last testament to the integrity of the attorney general who defied the president. Then–Deputy Attorney General Sally Yates speaks during a formal investiture ceremony for Attorney General Loretta Lynch June 17, 2015 at the Warner Theatre in Washington. 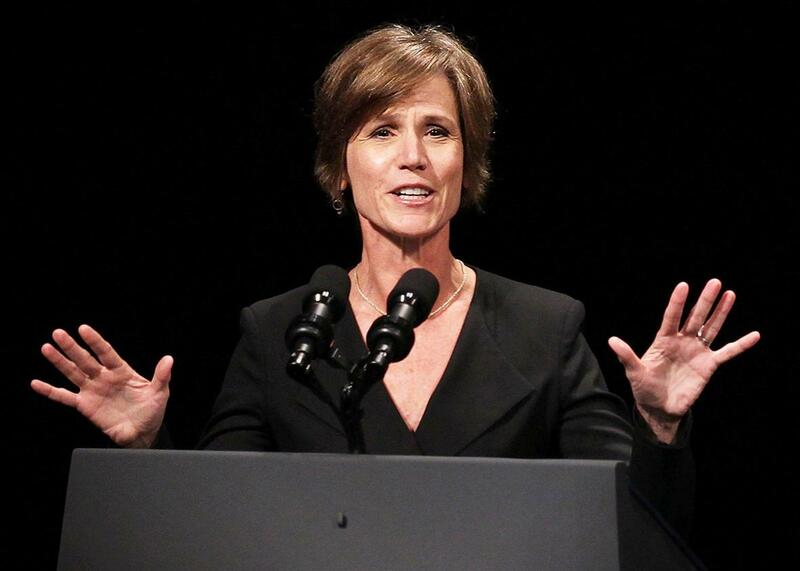 When President Donald Trump abruptly fired Acting Attorney General Sally Yates on Monday night, it was not the first time Yates faced the wrath of a government chief executive enraged by the refusal of a female subordinate to play along with a directive she considered improper. It was almost 20 years ago, in 1998. Yates was an assistant U.S. attorney in Atlanta, whose gentle Southern accent (of the old families of Atlanta) belied her already fierce reputation. Earlier that decade she’d led a federal prosecution into a massive corruption scheme tied to the city’s airport. I was then a ponytailed investigative reporter at the Atlanta Constitution, burrowing into City Hall criminality and covering the trials in which Yates sent seven men—including two powerful former city council members—to prison. Notably, it was an equal-opportunity prosecution. By the time the cases ended, the new convicts included black and white elected officials and businessmen. Rich or poor, Jew or Gentile, liberal or conservative—if Sally Yates had you on tape taking bribes, you went to jail. In 1998, the general manager of the airport complained to the Federal Aviation Administration about pressure she thought she was getting from then-Mayor Bill Campbell related to a $100 million contract for 20 million cubic yards of rock and soil needed to build a new runway. The mayor, a Democratic former city councilman who had been accused but never indicted in the earlier corruption scandal, was pushing for a bidding process that looked favorable to one of his big campaign donors. I wrote a story for the Wall Street Journal about what looked like the most expensive pile of dirt in history. The mayor denied any wrongdoing but was outraged that his airport manager had defied his plans. Within a few months, she was out of her job. But it turned out that Yates’ public corruption prosecution had never really wrapped up. She and local FBI agents were doing their own spade work into the mayor’s high-flying life, girlfriends, extravagant travel, $250,000 in alleged bribes, and suggestions of illegal campaign contributions from the dirt contractor. It dragged on for years—during which time Mayor Campbell and his allies waged an increasingly harsh public relations campaign against Yates. Despite the diversity of the first truckload of racketeers she sent to prison, rumors were spread that Yates was out to get black officials. Allies of the mayor said she was investigating him after he didn’t endorse Yates’ husband in an unsuccessful congressional bid. She became a near-pariah at City Hall. There was even a moment of public tension between Yates and another Atlanta figure who also would eventually be the subject of President Trump’s wrath: Georgia Rep. John Lewis. Through it all, Yates quietly kept digging, indicting, and usually convicting. In 2004, it was finally Mayor Campbell’s turn in the dock. He was indicted, and after a long and sordid trial, found guilty of tax evasion (though he was acquitted on the most egregious corruption charges). He was sentenced to 30 months in prison. The corruption cases Yates pursued in Atlanta changed the political character and direction of the city. She was appointed U.S attorney in Atlanta by President Barack Obama in 2010 and elevated by the president five years later to deputy U.S. attorney general. By then, she had prosecuted Democrats, Republicans, child-slavers, drug dealers, corrupt officials, corrupt business people, terrorists, killers, white folks, and black folks. As the second-highest ranking law enforcement official in the U.S., she was at the front line on terror cases, corporate prosecutions, and oversight of the FBI. Yates was also the point person for the White House for the past two years on President Obama’s accelerated commutations process for federal prisoners, leading to the release of hundreds of Americans being held for absurdly over-long drug sentences. Through it all, Yates was driven by a belief in the law and the equal application of it to all people, no matter who they are, what they look like, or how much money they have or don’t have. Then on Monday, Yates ordered all Department of Justice attorneys not to defend President Trump’s order barring entry to the U.S. for Syrian refugees and thousands of other visitors from certain Muslim countries. She said the legality of the order was questionable. President Trump fired her within a few hours. The White House issued a statement saying Yates’ legal objections were spurious and then the incredible charge that she had “betrayed” the Department of Justice. It sounded a lot like the claims of outrage and innocence those corrupt politicians in Atlanta had always made. Interestingly enough, almost every one of them I ever spoke to also seemed to genuinely believe that they couldn’t possibly have done anything wrong, and that the public adored them so much that they would always be forgiven for any slip-up. It didn’t work out that way. Most remarkably to me, a text message arrived on my phone two days after Yates was axed this week: A city councilman in Atlanta—one who hadn’t been there during the corruption eruption—had seen remarks I posted on Facebook about Yates. He said members of the council, the very institution that had been hollowed out by Yates’ anti-corruption crusade of the 1990s, wanted to issue a resolution in support of her defiance of the Trump immigration order. Other Democrats in Georgia were organizing to draft her to run for governor. What a difference two decades make. It’s not unreasonable to debate whether Sally Yates should simply have resigned rather than defy the president of the United States. Her public explanation was that as acting attorney general, she was bound by law not to defend potentially illegal actions by our government. Several federal judges have agreed so far. Various other legal scholars have lined up on each side. All of that can be reasonably argued. But one thing is certain: Sally Yates is as sterling and devoted a servant of the public as any American. And just as in 1998 and during all those other cases in Atlanta, she wasn’t afraid to stand up to an elected executive or any other official incensed by her devotion to the rule of law. Just like that long-disgraced mayor of Atlanta, who was certain he could never be wrong and never be caught, President Trump would have been wise to listen to Sally Yates. Now that she’s gone from the Trump Department of Justice, the president and his emphatically confident advisers should find and listen to other voices that—like Yates—have proven over decades that they are truly above politics and committed to justice, unintimidated by bullies, and ready to let the chips fall wherever they may. If a public official is unwilling to hear the counsel of someone like Sally Yates, he is dramatically more likely to one day be prosecuted by someone like Sally Yates.